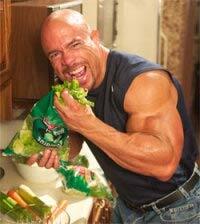 As a natural bodybuilder, I know proper nutrition is a key component to building a better physique. I know this through personal experience and the results of my clients, but don’t just take my word for it. The American Dietetic Association, Dietitians of Canada, and the American College of Sports Medicine state that optimal nutrition will enhance physical activity, athletic performance and recovery from exercise1. Without proper diet and nutrition, even with all the best training in the world, you’re still selling yourself short. You must meet energy and macronutrient needs, especially carbohydrate and protein, during times of high physical activity in order to replenish glycogen stores, and to provide adequate protein to build and repair tissue. In this article, I’ll teach you how to improve your physique by following these basic bodybuilding nutrition principles. If you’re trying to build muscle, your body will need an adequate amount of protein. 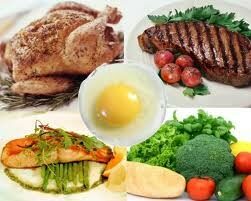 Protein builds and repair tissues and it has been documented that increased protein intake improves performance. Exactly how much protein do you need to meet your goals? The ADA, DOC and ACSM recommend that endurance and strength-trained athletes (bodybuilders) have between 1.2 and 1.7 g per kg of body weight (0.5 – 0.8 grams per pound) of protein for the best performance and health1. Therefore, any excess protein consumed isn’t going to improve your performance or strength gains. However, does that mean you should never consume more than the recommended amount and does consuming too much protein damage your kidneys? Let us set the record straight on protein and your kidneys. When protein is metabolized by the body nitrogen is produced as a by-product. Thus, making kidneys work to remove the extra nitrogen from the body, but making the body work harder isn’t necessarily bad. A review of the scientific literature on protein intake and renal function found that “there is no reason to restrict protein in healthy individuals.” The study also concludes that a low protein intake did not prevent the decline in renal function with age, and it could actually be the cause of this decline2 (discussion about low protein and renal function seems out of place here.) Now that the record on protein is cleared up, let us discuss how it pertains to you. Ideally, as a bodybuilder you should try to consume at least .8 grams of protein per lb bodyweight on a daily basis. That’s roughly 144 grams of protein for a 180lb person, but bodybuilders beware, not all protein sources are physique friendly. Not only are some animal protein sources high in saturated fat, which is a health concern, but the higher fat content means you’ll be consuming more calories as well. Consuming excess calories may lead to gaining the wrong kind of weight so try to stick to lean protein sources such as turkey, tuna, chicken breast, salmon, low fat dairy, lean beef, and egg whites. Carbohydrates have gotten a bad reputation over the years, but the truth is not all carbohydrates are created equal. The glycemic index or GI describes this difference by ranking carbohydrates according to their effect on our blood glucose levels. Refined/processed carbohydrates, found in products made with white flour, such as bread, pasta, muffins, donuts, cakes, and cookies are depleted of their naturally-occurring fibers. Because of this, these foods have a high glycemic index value, meaning they rapidly digest and enter the blood stream causing a spike in blood glucose levels3. In response, the pancreas releases insulin, which directs the cells to absorb the glucose. The more blood glucose the more insulin the pancreas releases. Unfortunately, insulin also promotes the storage of fat in the body if there’s excess glucose; which is why it is important to limit refined carbs and sugars. 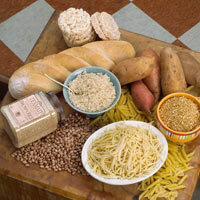 Sweet potatoes, oatmeal, bran cereal, brown rice, whole grains, beans, fruits, and vegetables are all examples of low GI foods, meaning they’re slower to digest and affect blood glucose levels less3; thus, increasing the likelihood of those carbs being used as energy instead of stored as fat. Plus, choosing carbs that digest slowly can help stave off hunger by making you feel fuller longer. Another benefit of low GI carbs is most of them contain fiber, vitamins, and minerals which provide a plethora of health benefits as well. Fat doesn’t always have to be the enemy. Dietary fat is a vital part of any diet because fat helps supply our bodies with essential fatty acids (EFAs), provides energy, helps us absorb certain vitamins, helps us grow and supports a strong immune system. Also, according to research published in the Journal of Applied Physiology by a team of Penn State University researchers, a positive correlation exists between dietary fat and testosterone levels 4 and when it comes to building muscle testosterone is the king of hormones. Studies show that testosterone, especially when combined with strength training, increases fat-free mass and muscle size and strength5. However, all this doesn’t mean you need to go on a high fat diet. Limit your intake of saturated and trans fats as they are thought to play a role in cardiovascular disease, obesity, and type 2 diabetes6. Try to stick to monounsaturated and polyunsaturated fats as such as olive oil, avocados, nuts, seeds, flaxseed, flax oil, walnuts and cold water fish like salmon as these fats have been associated with improved blood cholesterol levels6. So exactly how much fat do you need? The USDA recommends that only 20%-35% of your diet come from dietary fat as these ranges have been associated with a reduced risk of chronic diseases, and it provides adequate fat intake for essential nutrient absorption7. Skipping out on your pre workout meal is a big no no. Providing your body with a pre workout meal or snack that is high in carbs, moderate in protein, low in fat, and sufficient in fluids will help your body maintain blood glucose concentrations during exercise, maximize exercise performance, improve recovery time, and maintain hydration. Everyone’s workout schedule is a little different so the size and timing of the meal should be interrelated. Consume smaller meals 30-60 minutes prior to exercising, and larger meals when more time is available before exercise. However, most of us have heard the claim that exercising on an empty stomach burns more fat. Well, a study published in the International Journal of Sports Nutrition Exercise and Metabolism8 concluded that not only is the metabolism higher in the fed condition compared to the fasted condition, but that fat use is higher after exercise as well. Want to start burning more fat after your workout? Also, the study points out that after a pre-workout meal, not only is the metabolism high during the workout, but it stays at a high level for 112 hours after the workout. Start eating a pre workout meal. Weight training increases insulin sensitivity and glucose absorption, meaning it is easier for the body to absorb sugar from the bloodstream and store it in muscles and other tissues where it can be used as fuel to replenish glycogen stores and rebuild muscle tissue. After an intense training session, consuming carbs in conjunction with protein post workout provides more amino acids for muscle repair and promote a more anabolic (muscle building) hormonal profile1. Besides a protein shake, you can try chicken stir fry with brown rice, turkey/ tuna on whole wheat bread, egg white and spinach omelet, or even chocolate milk as a post workout meal or snack. How does this article benefit you if you don’t apply these nutrition tactics? It doesn’t. Just like you have to consistently lift weights over time to build muscle you have to consistently eat properly to achieve a better physique. ” Success is the sum of small efforts repeated day in and day out” (Collier,R) . Disclaimer: Before you begin any exercise program, and before you follow any of the advice, instructions, or any other recommendations in this article, you should first consult with your doctor and have a physical examination. 1^ Position of the American Dietetic Association, Dietitians of Canada, and the American College of Sports Medicine: Nutrition and athletic performance. J Am Diet Assoc. 2009 Mar;109(3):509-27. 2^ Walser M. Effects of protein intake on renal function and on the development of renal disease. In: The Role of Protein and Amino Acids in Sustaining and Enhancing Performance. Committee on Military Nutrition Research, Institute of Medicine. Washington, DC: National Academies Press, 1999, pp. 137-154. 3^ Am. J. Clin. Nutr. Glycemic Index of Foods: a Physiological Basis for Carbohydrate Exchange. Jenkins DJ et al. 1981, 34: 3. 5^Bhasin S, Storer TW, Berman N, Callegari C, Clevenger B, Phillips J, Bunnell TJ, Tricker R, Shirazi A, Casaburi R (July 1996). “The effects of supraphysiologic doses of testosterone on muscle size and strength in normal men”. N. Engl. J. Med. 335 (1): 1–7. 6>^”Dietary Guidelines for Americans” . U.S. Department of Health and Human Services, U.S. Department of Agriculture. 2010. Retrieved 2011-09-27. 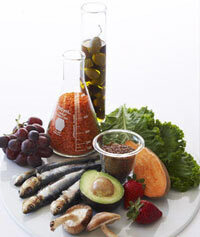 7^ “Dietary fats: Know which types to choose”. Mayo Clinic. 2011-02-15. Retrieved 2011-09-02.